Is a home sleep apnea test right for you? Do you have trouble sleeping? Or, maybe your mate complains about your snoring. Do you wake up in the morning and still feel exhausted? It’s time for you to talk to your doctor about getting either a home sleep test (HST), or an overnight sleep lab test polysomnography or (PSG). You may have sleep apnea or some other respiratory condition. A home sleep apnea test is a convenient, easier way to find out if you have a sleep disorder like sleep apnea. This is a test you can do in the comfort and privacy of your home. A home sleep test uses a portable-monitoring system that consists of a small recording device, sensors, belts and related cables and accessories. You apply the sensors to your body and turn on the recording device before going to sleep. The sleep recorder gathers important data as you sleep in your own bed. CPAP America will guide you through the process from ordering your home sleep test, getting set up, and working with you to get your results in a timely fashion. The best part is, the sooner you get tested and diagnosed, the sooner you can start getting treated – and enjoying the benefits. The home sleep test is a service, so you won’t have to store the equipment in your home. When the test is over, you mail it back to us. We pay the postage. Please note that although a home sleep test is a great option for adults, children cannot be given a home sleep apnea test. Do you have questions about a home sleep apnea test and what you personally need? Order your Home Sleep Test Today! Here are a few reasons why you should trust CPAPAmerica.com with all of your home sleep apnea testing needs. You’ll save money. Our home sleep testing service is only $249.00, and shipping is FREE. Without insurance coverage, overnight sleep lab tests can cost thousands of dollars. You’ll enjoy the comfort and convenience of being in your own home. Everything you need will be mailed right to your door. Work with experienced professionals. Trained clinicians are standing by to help you through every stage of the home sleep testing process – from setup to diagnosis. Personalized service means there’s no guesswork. Our sleep test kits come with detailed instructions to make setting up easy. Plus, you can call us toll free at 1-800-569-0167 with any questions you may have. Residents of Eastern Pennsylvania, Delaware or New Jersey can stop by our CPAPAmerica store and our expert clinicians can show you how to apply the sensors and monitors, and how to use the recording device during the night. 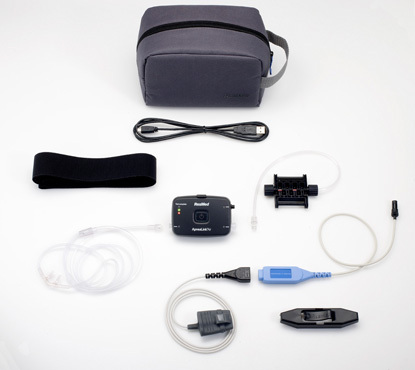 If you need CPAP equipment, we offer the best equipment at the lowest prices. If you see a lower advertised price, we’ll match it! Mail or fax us your prescription for the home test at the address below and place your order for the testing service. CPAP America will send you a home sleep test. On the night you’ve scheduled your home sleep apnea test, follow your normal evening routine, prepare for sleep, and attach the home sleep test equipment as you’ve been instructed and start the recording. In the morning, you’ll remove the sleep test equipment as previously instructed and mail the entire home sleep test kit back to CPAP America using the return label we will provide. When we receive your home sleep test, one of our qualified sleep clinicians will record your results. A Board Certified Physician will study the sleep test results. Your sleep test results, along with any treatment recommendations will be given back to us. CPAP America will call you with your results, and you will also be mailed a copy of the sleep test report. If you have a positive test for sleep apnea and a CPAP machine is recommended we will send the prescription along with the report.